It’s now common to see trampolines with safety nets and padding over the hard bits and springs. Despite this the rate of trampoline injuries continues to increase. So are trampolines getting safer? The latest research replies with a big, loud NO and has many parents asking why. Research from Monash University published in the Australian and New Zealand Journal of Public Health1 says trampoline injuries increased in the decade from 2002 to 2011 and points the finger at old and dangerous trampolines. Many regions around the world have safety standards in place that put a minimum requirement on the safety features of trampolines. These standards are meant to give parents peace of mind that the trampoline you invest in for your kids will be safe. But many safety standards are not mandatory and trampolines can still be sold without any safety features. Even worse, those that have padding and safety nets may offer a false sense of security if these safety features are of poor quality. Why do trampoline injuries continue to increase? It’s not easy to know if your trampoline is safe. Even if the trampoline was brand new and complied with the safety standard when you first bought it, many of the safety features will deteriorate very quickly and can make the trampoline even more dangerous. Trampoline padding: The pads that cover the springs and frame become ineffective when exposed to the sun and may need to be replaced every six months to be of any benefit at all. Dr Ian Incoll, former champion trampolinist and Australian Orthopaedic Association’s Education and Training chairman, said trampolining can be relatively safe. Many trampoline injuries can be prevented with well-designed safety features and some simple safety rules. One jumper at a time: We all want to see our kids play and have fun together but 75% of trampoline injuries happen when more than one child is jumping. Worst of all it’s usually the littlest kids that get hurt. Supervision is key: Keeping an eye on the kids whilst their using the trampoline helps keep them safe - more than 70% of injuries happen when there is no supervision. 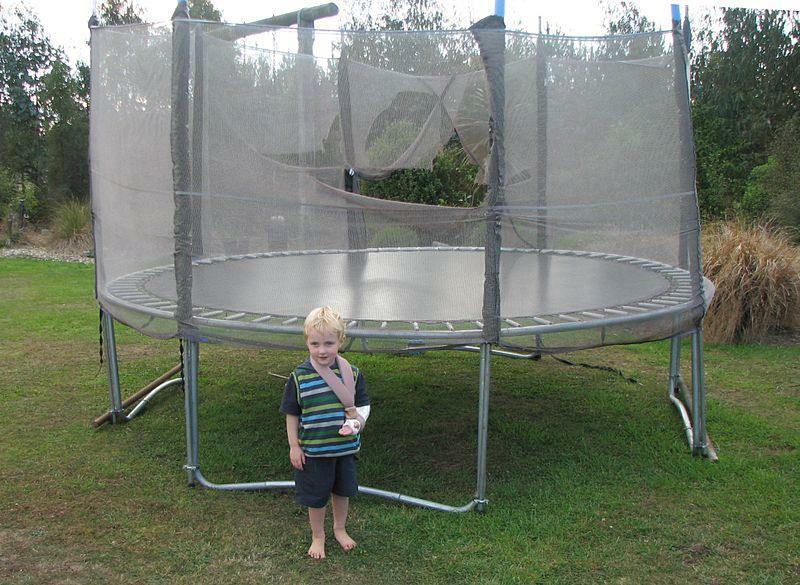 KidSafe recommends keeping your trampoline in good condition. Replace old and damaged trampolines and choose a design that has safety features that won’t deteriorate over time. The patented soft-edge design of the Springfree® Trampoline is more than 30 times softer than a traditional trampoline and this safety feature will last for the life of the trampoline. Choice tested 12 trampolines to see if the padding would adequately protect a child falling head-first onto the pads and only one trampoline - the Springfree Trampoline R54 – passed the tests.